In some cases you may wish to break a larger Sweave document into multiple Rnw input files. To support this RStudio allows for the specification of a root Rnw file that is always used as the target for PDF compilation. The root file can be specified on a per-file or per-project basis. RStudio also uses the concordance file generated by Sweave to ensure that both Synctex and TeX error log navigation work correctly in the presence of multiple Rnw files. NOTE: If you are using knitr rather than Sweave be sure to review the Additional Considerations for knitr section below. The Rnw root directive at the top of the child file tells RStudio that when you execute the Compile PDF command while editing the child that Master.Rnw should be the target for compilation. The path specified in the root directive is relative to the file it is contained in and can reference the parent directory using ".." (for example: root = ../Master.Rnw). Note that the file level directives described in the prior section take priority over any project level root file you have specified. If you are using knitr for multi-file compilations you should ensure that you are using knitr version 0.6 or later, as that version included important enhancements to generating concordance for multi-file compilations. You can also specify this option in your .Rprofile if you don't wish to include it in every Rnw file. Finally, there are some known limitations in the accuracy of file/line concordance in multiple-file knitr documents. 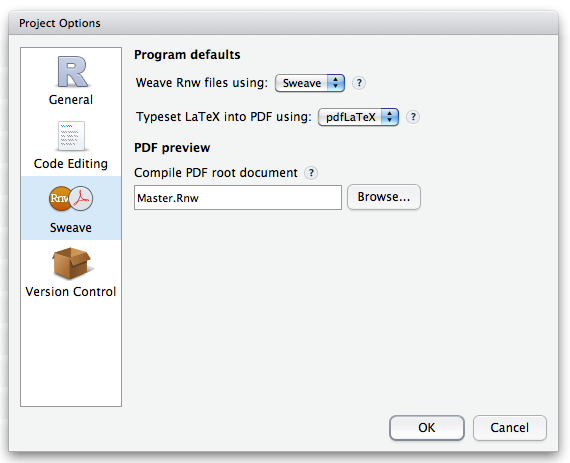 In these cases the file/line reported for LaTeX compilation errors or result of a PDF sync may be slightly inaccurate.